The global isothermal nucleic acid technology (INAAT) market is estimated to reach $1,651 million by 2018 at a CAGR of 13.5% during the forecast period. The market growth is primarily attributed to increasing demand for advanced isothermal based molecular testing over conventional thermal polymerase chain reaction (PCR) technology. The study covers different product, application, and end-user segments of the global isothermal nucleic acid amplification technology market. The INAAT product segment is categorized into reagent and instrument sub-segments; whereas, the INAAT application segment is classified into infectious diseases, blood screening and research sub-segments. 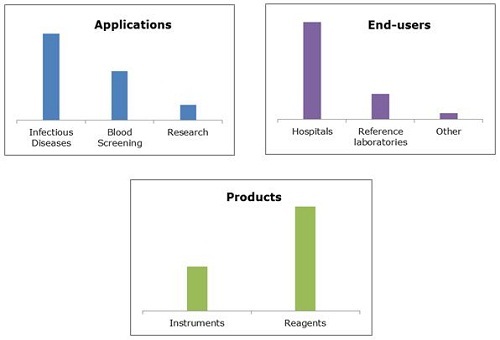 The scope of the end-users study of isothermal nucleic acid amplification technology includes hospitals, reference laboratories and others sub-segments. Analysis for different market dynamics identified less expensive molecular testing using INAAT, increasing prevalence of infectious disease and cancer, growing demand for enhanced throughput in gene amplification, and advent of novel technologies such as Loop-Mediated Isothermal Amplification (LAMP), Nucleic Acid Sequence Based Amplification (NASBA) and Helicase Dependent Amplification (HDA) as the key driving factors of the global market. On the other hand, dominance of PCR technology and inadequate infrastructure hinder the market growth. The hand held device accessible POCT device is expected to capitalize on the diagnosis market for different infectious diseases such as tropical disease and sexually transmitted disease due to its low cost and rapid testing facility. Moreover, the advent of real time Chip based Nucleic Acid Testing (NAT) for SNP genotyping and cancer might encourage the adoption of INAAT due to its rapid turnaround time. Difficulties in developing lab-on-chip due to lack of multidisciplinary approach, and entry barrier in the PCR dominated emerging nations are considered the major challenges of the global market. Amongst various application areas, INAAT is widely used for the detection of infectious diseases; it is expected to grow at the highest CAGR of 14.4% during the forecast period due to high incidence rate of various infectious diseases such as HIV and hepatitis A & B globally. On the other hand, rapid emergence of reference laboratories and rising importance of isothermal technology in different complex molecular testing are expected to ensure a significant adoption of technologies in reference laboratory. North America commanded the largest market share of about 44% in 2013; whereas, Asian market is expected to grow at a higher CAGR during the forecast period. It is primarily due to increasing prevalence rate of infectious diseases and significant adoption of novel technologies. Capitalization on the unmet needs in infectious disease treatment market is expected to lure leading players to penetrate into emerging nations such as India, China, South Africa, Singapore, and Middle East. Notable players in the global isothermal nucleic acid amplification technology market include Alere, Inc. (U.S.), Becton, Dickinson & Company (U.S.), BioHelix (U.S.), bioMerieux (France), Eiken Chemical Co. Ltd (Japan), Hologic Gene-Probe (U.S.), Lucigen (U.S.), Meridian Bioscience, Inc. (U.S.), New England Biolabs, Inc. (England), Novartis Diagnostics (Spain), Nugen (U.S.), QIAGEN (The Netherlands), and Ustar Biotechnologies, Ltd. (China). The isothermal nucleic acid amplification technology (INAAT) market is poised to reach $1,651 million by 2018 at a CAGR of 13.5% during the forecast period. Despite the dominance of polymerase chain reaction (PCR) technology, INAAT is expected to seize a considerable market space in the global market since it enhances the quality of point-of-care testing using miniature DNA diagnostics. Major driving factors of the global market includes increasing prevalence of infectious disease and cancer, promise for less expensive and better throughput in gene amplification using INAAT, and advent of novel technologies such as Loop-Mediated Isothermal Amplification (LAMP), Nucleic Acid Sequence Based Amplification (NASBA) and Helicase Dependent Amplification (HDA). However, inadequate automation and portability, and high dominance of PCR technology restrict the adoption of isothermal amplification technology globally. Reagent segment held the maximum share of 70% of the global market in 2013; the segment is expected to grow at 14.7% CAGR due to increasing consumption of reagents in the detection of chronic diseases and genetic disorders. Future scope of market development lies in less expensive and portable POCT device as well as real time Chip based Nucleic Acid Testing (NAT) for SNP genotyping and cancer. Currently, difficulties in developing lab-on-chip due to lack of multidisciplinary approach, and high entry barrier in PCR dominated emerging nations restrict the market momentum in the developing countries. Infectious disease was found to be the highest revenue generating segment (57.2%) of the global isothermal nucleic acid amplification technology market in 2013; it is expected to grow at a double digit growth during the forecast period. It is primarily attributed to high incidence rate of various infectious diseases such as HIV and hepatitis A & B, and increasing importance of INAAT in infection detection globally. Adoption of INAAT in blood screening application is also expected to grow as it ensures the quality of donated blood through its early prognosis of pathogen; whereas, cancer research, whole genome amplification, mutation, SNP detection and expression analysis are expected to drive the INAAT research application market. Amongst different end-users, hospital segment accounts for the maximum share of the global end-user market in 2013. However, INAAT adoption in reference laboratories is expected to grow significantly due to increasing awareness of isothermal technology in different complex molecular testing. North America contributed the largest market share of about 44% in 2013. On the other hand, increasing prevalence of infectious diseases and significant adoption of novel technologies are expected to drive the Asian market in the coming years. India, China, South Africa, Singapore, and Middle East were identified as the major focus areas amongst different emerging nations. The notable players in the global isothermal nucleic acid amplification technology market include Alere, Inc. (U.S.), Becton, Dickinson & Company (U.S.), BioHelix (U.S.), bioMerieux (France), Hologic Gene-Probe (U.S.), and QIAGEN (The Netherlands). 11.5 Eiken Chemical Co., Ltd.
11.13 Ustar Biotechnologies (Hangzhou) Ltd.